Home gym equipment comes in many shapes and sizes. For some, it’s a fully decked out garaged filled with dumbbells, barbells, and racks to support their strength goals, while others have one or two pieces of equipment like a cable rack. Below we’re going to dive into the multiple types of home gym equipment one can use to reach their fitness goals. Throughout this article, we’ll address home gym equipment as any piece of strength gear you utilize at home. Since home gym equipment comes with so many options, we wanted to put them into more specific categories to help out those who may feel overwhelmed when building, and searching for their perfect home gym equipment. What a home gym actually is will be dependent on the user or consumer. For most, when they think of home gym, they think of a decked out basement or garage, but that’s not always the case. Standard lifting equipment, elaborate machines, and even elastic bands are all technically forms of home gym equipment. If you’re using strength equipment at home, then you’re technically utilizing a home gym; it just may not be in the form of the traditional definition or idea. Below are some great options, in our opinion, of home gyms for a variety of goals. This customizable home gym setup is perfect for the brand new home gym owner trying to build their ideal gym. A bodyweight focused total gym that provides up to 50 lbs of additional resistance and the ability to perform over 100 exercises. 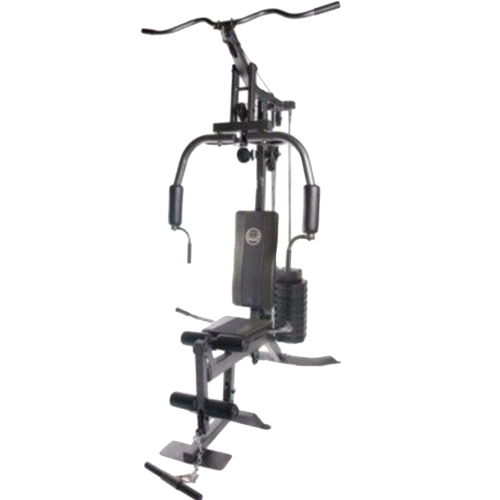 A fully streel versatile total gym that provides 150 lbs in resistance and the ability to perform over 30 exercises. This chair is great for senior citizens who want to remain active in their own home. This squat stand is simple and durable. It will work perfectly for athletes at all levels. Versatile Bowflex model that provides a fold up bench and the ability to perform over 30 exercises. 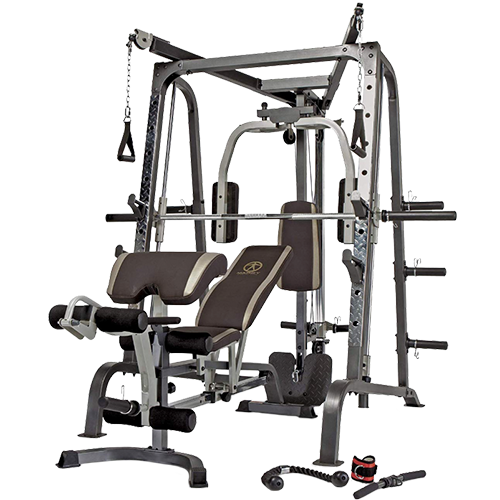 This all-in-one gym will provide any exercise a bodybuilder will need to perform for maximal gains. This package has all of the basics for the home gym owner building out their barbell and plates. 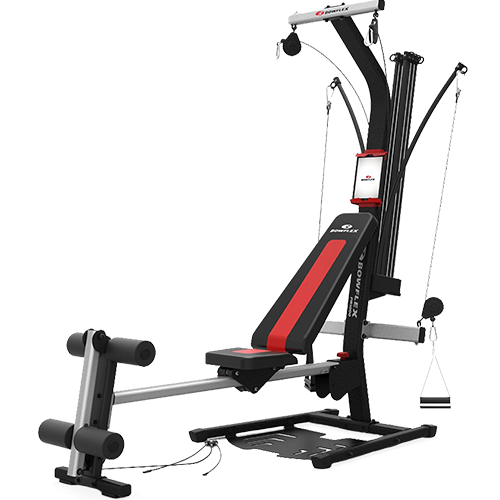 A versatile home gym that offers a 112 lb weight stack and up to 280 lb in work out resistance. A great home gym for the beginning lifter with a solid 150 lb weight stack and multiple exercise availability. This is the perfect home gym set for anyone who loves compound movements and makes that their focal workout point. A home gym can be anything you use at home to support your strength goals. Home gym equipment has been used for many years by a variety of fitness lovers, and equipment continues to grow within their respective categories with constant new innovations. There are multiple settings where one can set up and use their home gym, or home gym equipment. If someone is making a complete gym at their home, then a garage, basement, or empty guest room is usually the setting it takes place. On the other hand, for those with limited space, then they may have one versatile machine, or a composition of smaller equipment pieces that sit in an area with ample space for them. In terms of equipment, it’s not an easy feat clarifying what’s the most popular, or typical for users to keep in their house. Although, one can define what’s most typical by the type of gym and strength goals they have. 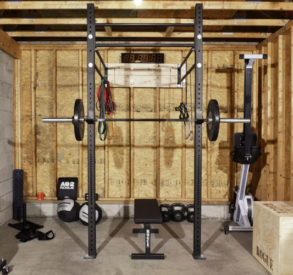 For example, if someone has a garage gym, then you’ll often see a squat rack, barbell set, and possibly dumbbell sets as the most common/typical pieces of equipment. Conversely, the individual who lives in an apartment setting, or doesn’t have as high of strength aspirations may use one of the popular versatile machines like a BowFlex, or cable machine. For this setting, these pieces of equipment would be considered typical. Then for an older individual, they may utilize a seated cable chair, or other forms of elastic band setup. Either way, it’s not easy to claim what’s the most typical until you break down an individual’s strength goals, training age, and gym setup location. There are multiple reasons why a home gym can be beneficial, and a lot of them will vary from person to person. Possibly the most common benefit of a home gym is the convenience factor. If someone is busy, or doesn’t want to attend a gym, then a home gym is an easy way to achieve fitness goals, while saving time and working out at home. Additionally, there will never be a wait for equipment, which can be a major time saver. Another home gym benefit is the creativity that comes with them. An individual can completely customize their setup to match their needs and goals. Since they’re designing their own space, then they can purchase only what they need. Plus, there are multiple types of equipment for a variety of settings, so an individual can be as creative as they’d like when building out their home gym with the space available. The final major home gym benefit is long-term savings. Home gym equipment can be expensive, but it’s an investment. Over a long period of time, owning your own equipment can save you money in two ways. First, more than likely, you can drop your gym membership fee, and over time that can add up. Second, it saves you the time you’d be driving to and from the gym, along with time you have to wait for equipment. For most, this extra time can turn into energy and time invested in other areas of their life. Is a Home Gym Setup Right for You? A better way to look at this question is to break it down into three smaller questions. The questions below will help you decide if investing in home gym equipment, or building your own gym is a wise realistic financially savvy choice. What are your strength goals? If you have very committed strength training goals, then you’ll probably realize that building your home gym will take a little more effort and money. More than likely, you’ll need equipment that complements your goals. But on the opposing side, after the initial purchase of equipment, then you’ll have your perfect setup for your goals. And if you’re someone who just needs a piece of equipment to maintain a certain level of fitness, then your effort and finances will be much lower, which makes buying home gym equipment a little easier. Another question to ask yourself is how much space you have. This is a question that can help guide you into what equipment will be best for not only your goals, but resources. Someone with more room can be a little more lenient with what they purchase, while someone working with limited space will have less options to choose from. This question is simple and will vary from person to person. Before investing in home gym equipment, we recommend realistically calculating your current gym expenses and how much you’re willing to put into a home gym. The final and last question is slightly bias towards the individual in question. But how much do you value your time? It’s a no brainer that a home gym can save you time in the long run, so how much is your time worth? If you’re someone who needs something quick and versatile, then you may find a home as a sound wise investment. 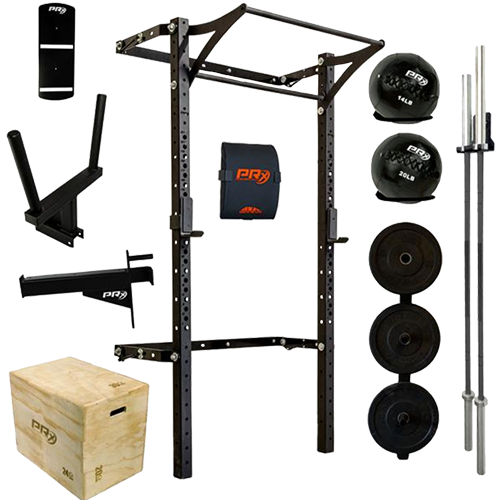 The W-4 Garage Gym saves an athlete time by providing them a home gym package of strength equipment. This package comes with the ability to add in all of your basics. 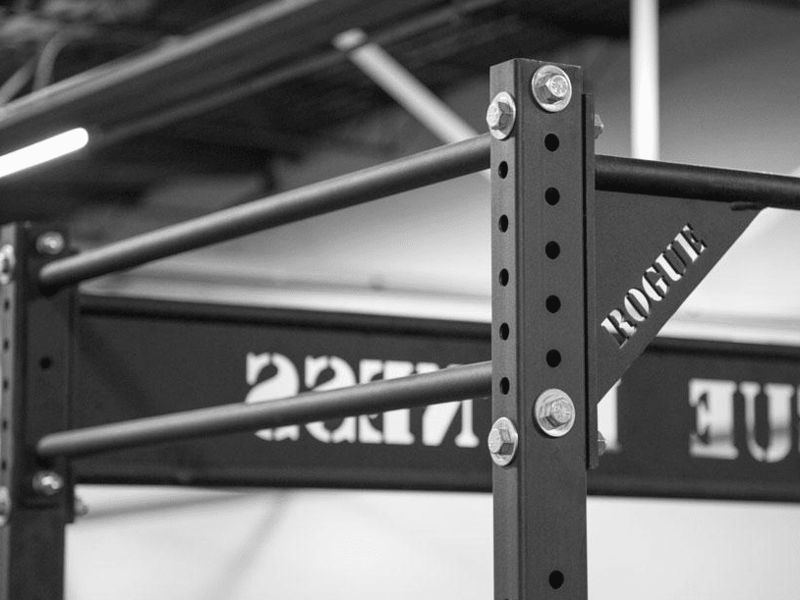 Rogue Fitness aims to save an athlete some time by providing a list of equipment that someone frequently buys together to build their home, or garage gym in this case. 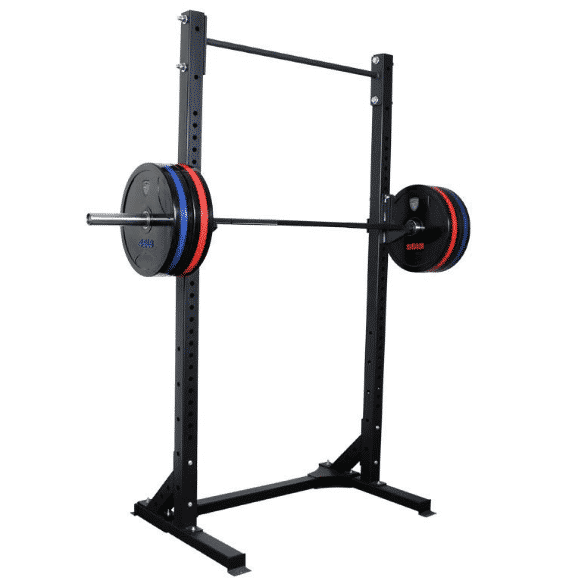 They include things like a customized rack, bench, plate holder, barbell, box, and much more. 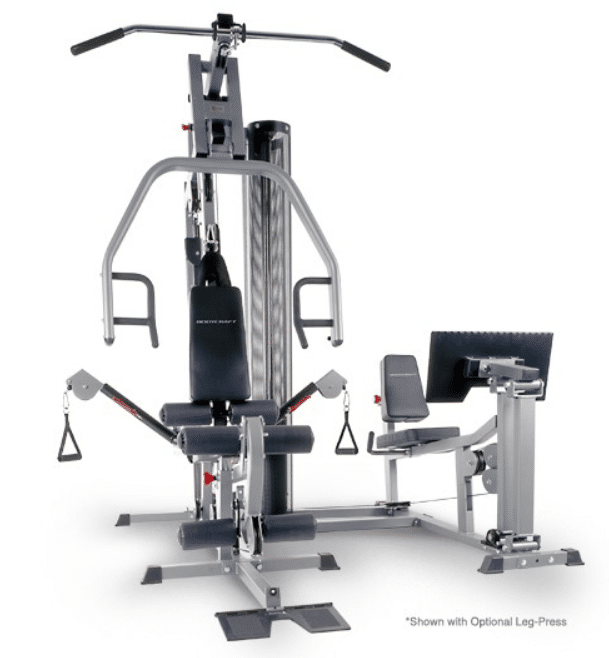 We like the Weider Ultimate Body Works machine because it can be easily stored in a variety of living settings. While it’s not going to benefit the serious strength athlete that much, it is a viable choice for someone who needs a quick workout in a small setting. Another factor that earned this piece of equipment its spot on our list is how versatile it can be. 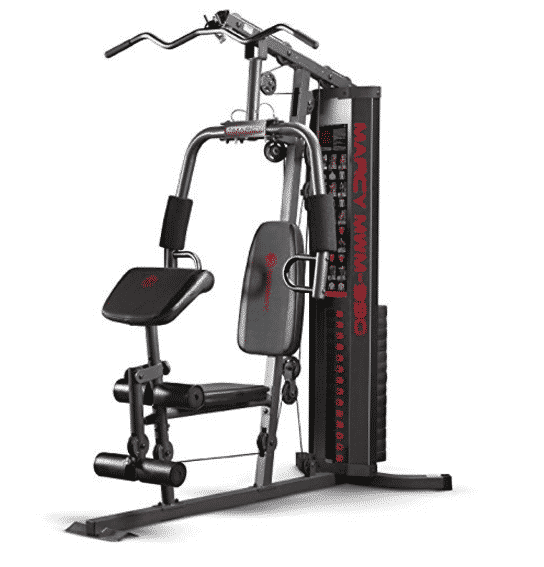 The Marcy 150lb Multifunctional Home Gym makes our number one pick for a couple reasons. First, we like how simple the machine is, and how affordable it is. It’s a good choice for the strength athlete who may be newer and wants to learn basic movements. Second, we like the 150 lb weight stack, as it’s not going to be incredibly easy for a beginner to max. Lastly, it has images of exercises on the machine, so a beginner can navigate movements with ease. 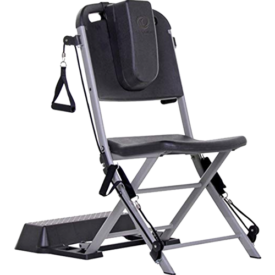 The Resistance Chair Exercise System is a machine that utilizes resistance cables to produce a training benefit, which can be useful for someone with possible musculoskeletal issues. Second, it can provide a full workout from a seated position, and that can be useful for someone with possible workout limitations. Lastly, it requires minimal setup and will work for a variety of fitness levels at the senior age. The Rogue S-2 squat stand is super simple. 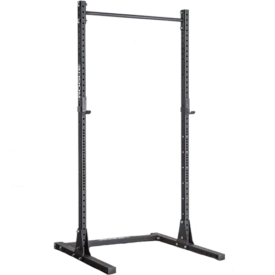 For the strength athlete interested in building their legs with squats, we feel as though this rack is a good starting point. 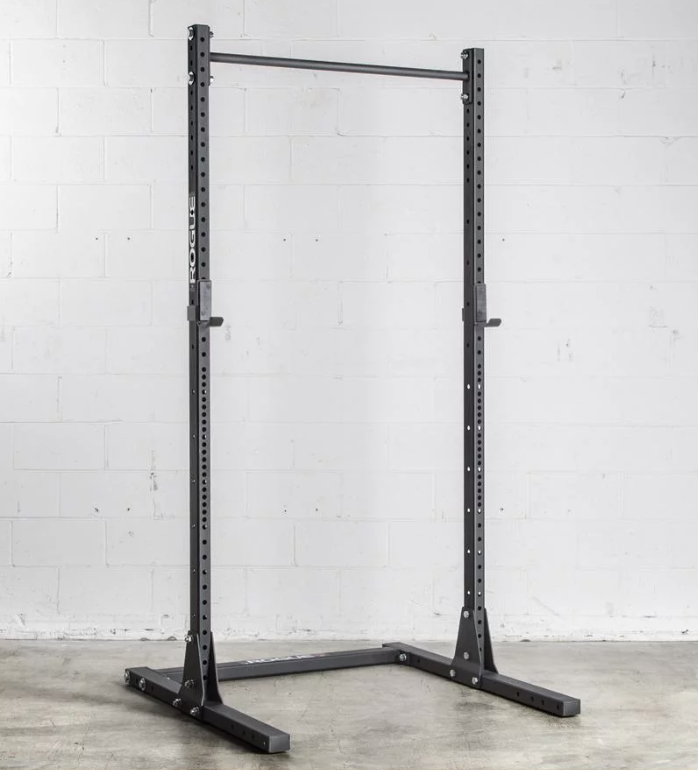 In addition, there’s a pull-up bar at the top, so it’s slightly more versatile than a simple rack. Someone living in an apartment will have limited space, and more than likely not have the ability to slam weights on the ground. 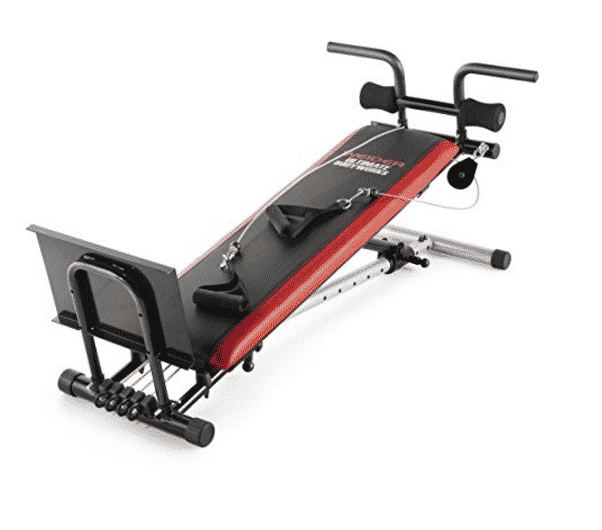 The Bowflex provides one with resistance and the ability to workout quietly. We thought it was a great fit for someone who may be in an apartment with ample room, but still the need to remain relatively quiet. 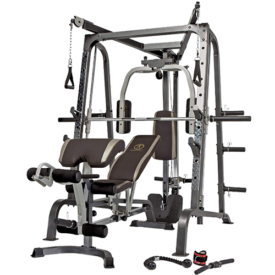 We like the Marcy Diamond Elite Smith Cage Gym because it comes in one large piece and has multiple tools a bodybuilder could use to benefit their gym progress. There are multiple attachments this type of athlete can use to provide their body with plenty of time under tension. The mixture of cables, smith machine cage, and free weights is what earned this as our top pick for bodybuilding athletes. We like Rogue Fitness because they offer multiple packages with equipment. This saves a buyer time when trying to find a set of equipment that will complement their asks, wants, and needs. 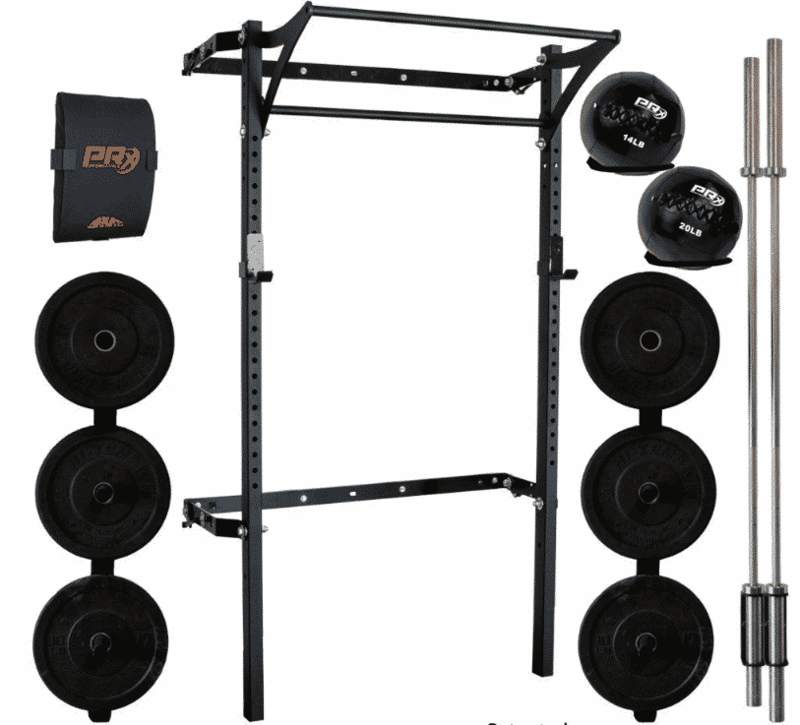 Possibly the best package Rogue Fitness offers is the W-4 Garage Gym set. This package contains your home gym equipment essentials, along with providing you the option to add in additional pieces of equipment. The Charlie CrossFit Package by Rogue Fitness makes our top pick for home gym equipment for a full body workout. This package comes with all of the essentials to tackle almost any CrossFit WOD. We like how they include up to 230lbs of plates, a medicine ball, rings, and much more. The Charlie package doesn’t need a ton of space, and can equip a lifter with the basics. In addition, they provide you with a decently heavy kettlebell, which could be used for a variety of exercises outside of barbell movements. The PRx Performance His & Hers Profile Package makes our top pick for the best home gym designed for the garage. 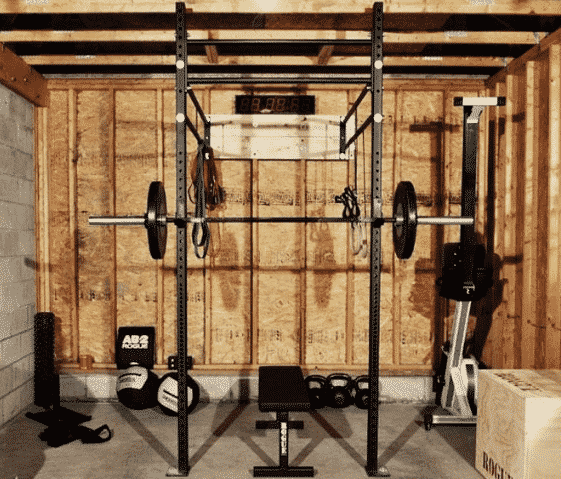 This package includes everything someone would need to start building the perfect garage gym. It comes with a rack, two medicine balls, plates up to 275lbs, a box, two barbells for men and women, plus much more. 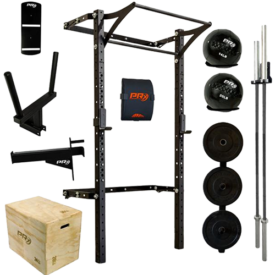 Someone who’s interested in building out a full garage gym will want to equip themselves with a full range of equipment, which this package includes. 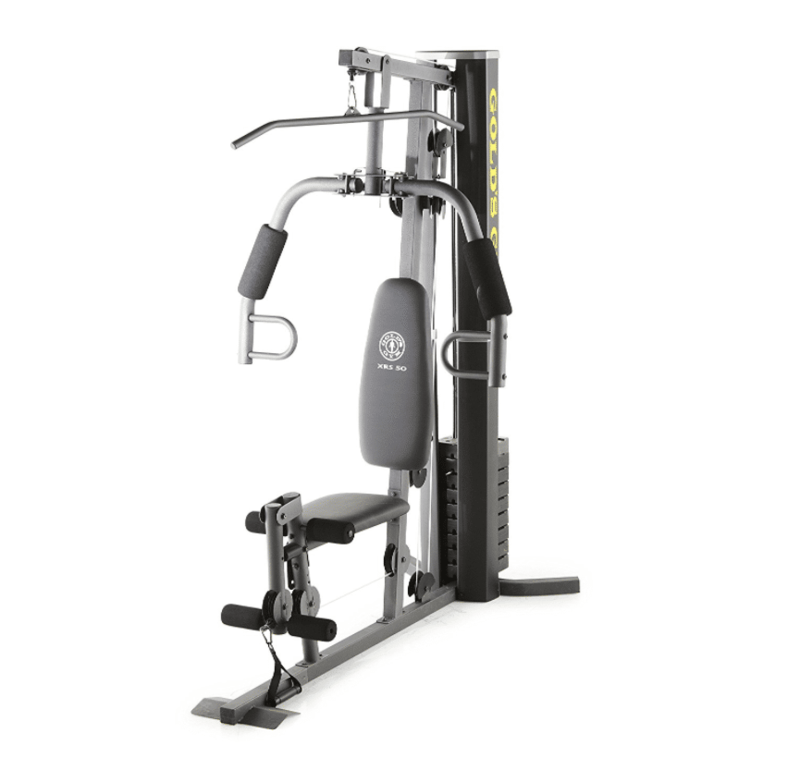 One of the best home gym picks for the money is the Gold’s Gym XRS 50. This piece of equipment provides good overall value. If you’re interested in achieving somewhat of a rounded workout, then this piece of equipment may serve you best. 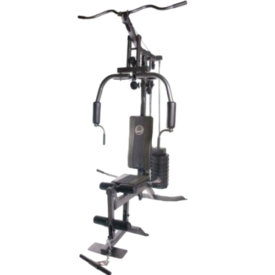 It offers tools for training legs, back, chest, and more. In addition, they offer a three and four year protection plan, which is a nice feature to ensure this piece of equipment will last for a while. Our top pick for home gym equipment in this cateogry is the CAP Barbell FM-H1005 Value Home Gym. This piece of equipment has all of the essentials you’d want for a full body machine oriented workout. It comes with a 150lb weight stack. 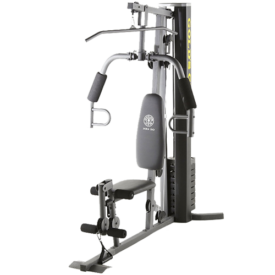 We like this piece of equipment because it has your standard exercise tools, such as a lat pull down, chest press, and leg training attachment. But what really earned it our number one spot is the 150lb weight stack, which is higher than most similar pieces of equipment. Our favorite home gym under $1,000 is the Rogue Fitness Alpha Bar & Bumper Set. This weight set is simple and comes with the bare minimums for barbell training. It equips you with a barbell, collars, and 320lbs of plate weight. If you’re someone building a gym, or into barbell training, then this option is a solid choice for you. Plus, with bumper plates they can be dropped and used for long periods of time without durability issues. There are multiple companies that are designed to help equip someone with their perfect home gym. All of them cater towards different levels of fitness, or strength athlete. For example, Rogue Fitness offers equipment that’s designed to support a variety of strength athletes, but also slightly more elite athletes. They offer multiple racks, garage packages, CrossFit packages, plate & bar sets, along with individual pieces of equipment. A similar company that has built a strong name for themselves in terms of home gym equipment is American Barbell. If an athlete is considering building their own home gym, then they should consider every aspect they need and look into different packages these companies offer. Another good resource for building your home gym is PRx Performance. This company focuses on providing you with a variety of equipment and packages, but also offer the ability to finance. For most, building a home gym can be a daunting experience, so the finance option adds a nice feature for softening the upfront money blow that may come with a big purchase. A home gym can be defined as anything a lifter utilizes at home to pursue their fitness goals. Working out at home can be a great long-term way to save time and money, but building your perfect gym can be a daunting experience. If you can break down your goals, needs, wants, and budget, then finding the perfect equipment can seem slightly easier. I currently use the TRX. The Weider Ultimate Body Works looks promising and I would consider using my gift card to purchase it and an iTunes gift card. I have nothing at the moment! SO using the Amazon card- it would be amazing just use it towards getting a barbell, maybe Rogue Fitness Alpha Bar & Bumper Set! I wish I had room in my apartment for a home gym. If I had that $200 GC for Amazon, I would use it to buy some quality resistance bands, some nice barbell collars for a new squat bar, and maybe some new training shoes. I don’t use anything but I’d use the GC on computer accessories tech. I own a home gym with free weights and machines — Body Rider BRF700 Fan Upright Exercise Bike, Sears Lifestyler ESP Treadmill, Stamina Mini Exercise Bike with Smooth Pedal System, and Tony Little’s Gazelle Edge Glider. I want to buy a rowing machine next. (Best Home Gyms 2018) These are all some great home gyms, I know we would get some great use out of any of these. I don’t think I have any of this stuff in my garage gym. 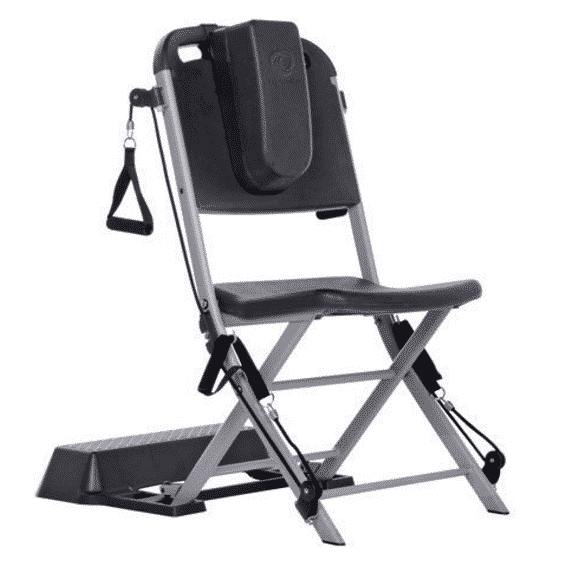 I like the Resistance Chair Exercise System! I’m a senior, and want to be careful, and this is the first time I’ve ever seen this. It is very nice!!! I rent an apartment with access to a gym so no home gym for me. I have a Marcy weight bench, barbell, dumbbells, kettlebells and bands. I would use the gift cards towards purchasing a quality rowing machine! I am in what can best be described as “horrible” shape….if round is a shape. I’ve been looking for a bench that I can sit on without fear of collapse (I do weight that much) and have been looking at weight lifting benches as a way to move while using resistance bands, and not worry about breakage. I found this item listed and it seems to have a lot of what I am looking for with a nice weight limit I can work with. The Resistance Chair Resistance Band Seated Exercise System is one I will have to show the misses. No. I don’t have room for a home gym. I prefer a home gym with machines, it seems to give me a better workout & is more motivating for me. I have a treadmill and rowing machine 🙂 I really enjoy working out indoors. Desperately need a home gym to help combat osteoporosis. A certified personal trainer would be a plus ! I never knew it was so many pieces. I am limited to space, but I need something that’ll help my flatten my stomach and strengthen my legs. What I would do with the gift card is would add it with my balance and hopefully have enough for a treadmill. That is my next purchase that I am saving up for to buy. My apartment complex has a nice sized workout facility making an in-home gym redundant. We do have a home Gym with free weights and machines. I prefer a home gym as I don’t like being talked to or messed with when I work out! 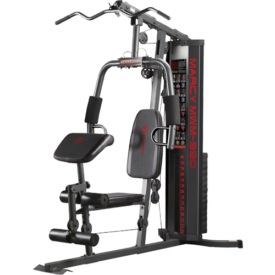 I don’t have a home gym at this time but I think the Marcy MWM-990 Home Gym would be a good fit for me. My home gym is an assortment of equipment I’ve put together. I’m currently saving for a quality rowing machine. I only have a bench and free weights at the moment. I’d use the gift card to go towards an elliptical. The Resistance Chair Exercise System looks like what I need. Thanks for the reviews. I don’t have a home gym. At this time I don’t have a home gym (recently moved). I do have some bands and free weights though. Along with a pair of shoes, I would buy some more equipment with the Amazon gift card if I win it. I need to build up more arm strength and work on my legs. I don’t have a home gym except for a few hand weights and bands which I never use. I workout at a gym-need to be away from home and like to workout with other people. I also belong to a yoga studio. When the weather is warm, I walk, hike and bike . 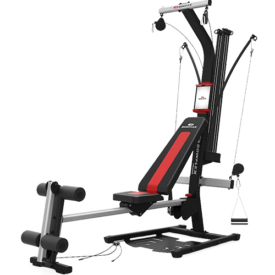 My husband does the regular gym now but I want to get him started at home and the Bowflex 1000 is a good option for us and that is what I would get him to start and slowly add in other things. Such great info and so glad I found your blogs!! Currently I only own a treadmill and an elliptical but I have been thinking about adding to it. Thank you for all the great information and for trying all the different home gym so I don’t have to and have a better idea of what I want. I don’t currently have a home gym. I’ve been looking at the TRX which I don’t see under your recommendations. What do you think of it? I would probably use the gift card to get a TRX. I don’t have a home gym. I might use the card for a fitness tracker. I don’t currently own a home gym. I might use the gift card on an exercise bike.